Did you know that the design of La Vaguada shopping mall in Madrid was created by Cesar Manrique? But let’s not talk about the capital city. Instead we’d like to introduce the amazing landscapes of the island where the great artist was born. Lanzarote is a land of contrasts: the blinding sunlight and the cool ocean waters, the scorching volcanic sand and the pale blue sky mixing into the enigmatic energy and tranquility that reigns on the whole island. Manrique has managed to translate Lanzarote’s natural beauty into art works better than anybody else. Therefore, it is almost impossible not to recognize his legacy in the northernmost of the Canary Islands. Cesar Manrique’s landscapes came straight out of his imagination and he painted them with his own hands, proving -at least in many examples- that nature and art can really work together, as you can see in Jameos del Agua, Mirador del Río… Do you want to know more? First of all, who exactly is Cesar Manrique? He liked to say that he was an artist who expressed himself through the media that was relevant for the times, and this meant that he actually used all media. He was a painter, a sculptor, an architect… but always passionate about his land to the extent that his home island became his largest canvas or the perfect model for a perfect sculpture. 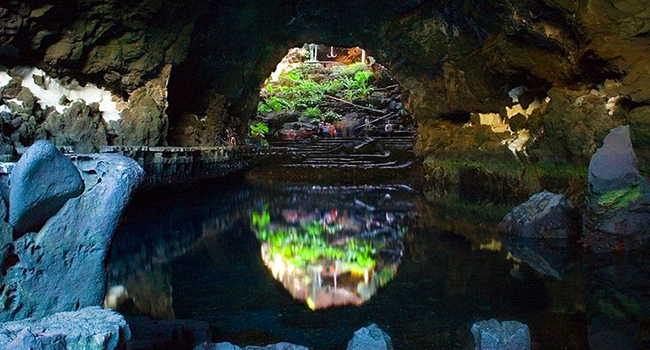 The result is translated in landscapes that are true works of art, such as Jameos del Agua, his first intervention in the unique nature of Lanzarote. He wanted to transform the island, and he did so from its volcanic foundations by creating a tunnel that connects the Corona Volcano to the Atlantic. Spiral staircases built into the rock, a stunning cave capable of housing a lake showcasing beautiful lights and reflections, blind white crabs, total darkness, and the world’s best natural auditorium. We’d better not mention the beautiful landscape, you should go see it! And when you get back out on the sunlight from the darkest depths, the natural reflex is to look up and look around as far as the eye can encompass. 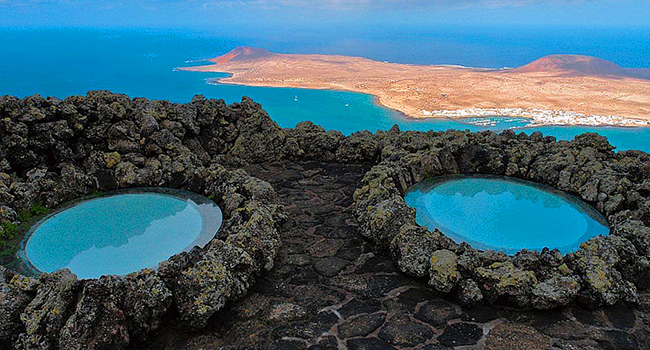 The best place to do so in Lanzarote is Mirador del Río. On one of the most spectacular cliffs of the island, the Risco de Famara, at over 400 meters , hidden under the same rock that slopes towards the sea, and barely perceptible to the eye, one can find one of his most emblematic buildings. Seamless integration, the perfect mix between nature and art. Best of all is to look out its large windows and terraces. On clear days, you can even see Isla Graciosa, Montaña Clara, Alegranza, and Roque del Oeste, contrasting with the reddish color of the Salinas de Guza. The landscape is central to Manrique’s work, and this is not his only viewpoint. In the neighboring islands of El Hierro and La Palma he also created other privileged observatories. From there you cannot see the Geria Valley, or appreciate its unique way of cultivating the grapes -this is how Malvasia wines are produced-, but this is undoubtedly one of the landscapes that will totally surprise you. All these volcanic stones, piled in a semicircle form, are not Manrique’s work, of course, but they serve as a reminder that Lanzarote, despite the aridity, is a land of farmers. In honor of all those who have worked the land the created the Monument to the Peasant, and the funny thing is that he did so with old fishing vessel’s water tanks that he found in the area. You can visit it in the town of San Bartolome, where you will also find the House-Museum besides it. This is an extraordinary example of a traditional farmhouse that was restored by the artist following the Canary architecture style, but introducing all the contrasts of his personality through lights, colors, and materials. Onions, potatoes, corn, and fruits such as lemons, bananas and figs. Farming land on an island where there hardly are any vegetation, forests and trees except those that can be found in the Valley of a Thousand Palms, Famara or Riscos de los Ajaches. 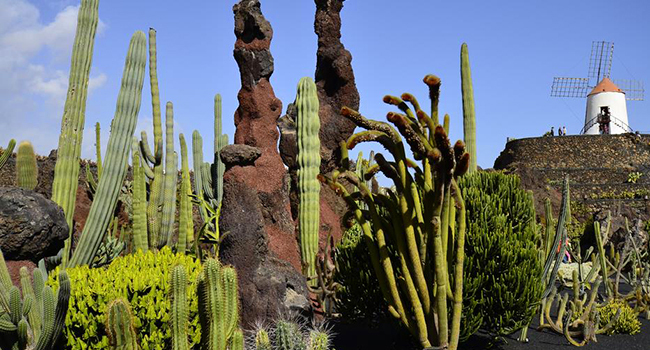 Therefore, although it may seem otherwise, vegetation is very important in Lanzarote, and the creation of spaces like the Cactus Garden in Guatiza is highly appreciated. In this corner of the town of Teguise, one of the largest plantations of tunera cacti grow in order to farm cochineals for dye. There, along winding cobbled paths and steps at different levels about 7,200 specimens of cacti of more than 1,100 different species from as far as Madagascar, Tanzania, Peru, Chile and the United States gather beautifully arranged. And the mark of Manrique is also present here! After seeing all these buildings, who would not want to visit the place where this master mind used to live? 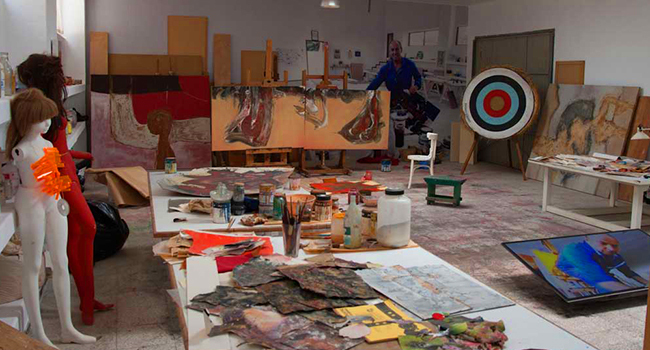 Cesar Manrique’s home, which now houses the headquarters of his Foundation and Museum, is another key element to understanding the essence of his inspiration. Water, fire, air, earth… all the elements that you can admire in the landscape are all combined and concentrated here. It is a large farmhouse surrounded by an exotic palm tree forest. Those who have visited it say that every room and every corner combine comfort and aesthetics equally, yet imbued with all the whirlwind of creativity that surrounded his figure. Will you be the next one to feel it? 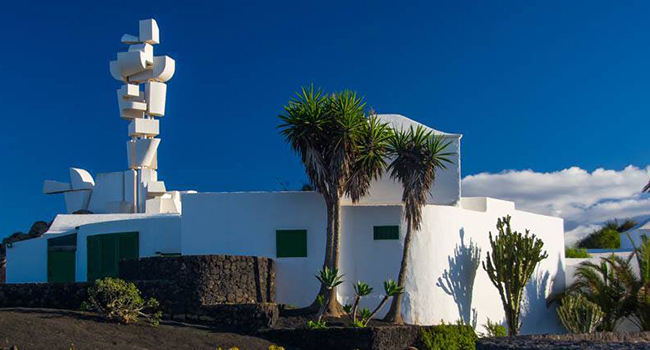 Lanzarote is a land of contrasts but is impossible not to recognize Cesar Manrique´s legacy in the northernmost of the Canary Islands. Come & discover it!